When you think of building your list what comes to mind? Do you think of sending out endless newsletters? I want to show you there is more than one way to build your list, in fact there are 6! There is more than one way to build your list with social media, in fact there are 6! Today I’m going to tell you SIX different ways you can use your social media platforms to build your list consistently and passively without having to do much but sit back and watch ‘em sign up. (And of course occasionally refresh your post). First you need to create a “squeeze page” or a landing page so people can opt in to your freebie. The reason a squeeze page works so well is due to the lack of “distraction” that a normal web page has. There is no header, no tabs, no side bar, nothing at all to take the attention of your prospect opt-in away from what you have to say and what they get. To create this page for yourself does take a bit of techy knowledge, so I suggest contacting your web person first and asking them to build the template for you with the copy and opt-in that you provide. Click here (link no longer available) for a fantastic article on what you should include on your squeeze page, how to create one, and where to find instructions if you want to do it yourself. Once you have your squeeze page set up I want you to create a bit.ly link to that page. 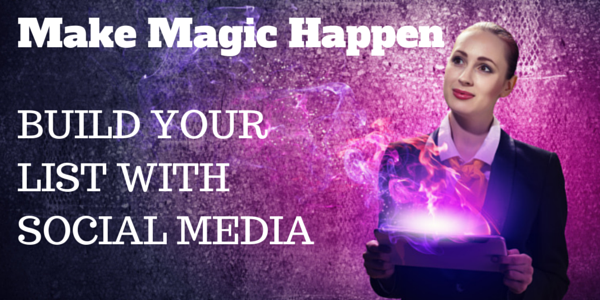 With that one little link, I am going to show you how to make magic happen with the 6 places you can use your squeeze page on social media to build your list. Log in to every single one of your social media accounts. In the header section or about section of each one I want you to copy and paste that link. For Pinterest: Create a pretty pin with a short quote or sentence describing your freebie, maybe quote a testimonial you have. In the description of that pin give your one sentence pitch and link to your squeeze page. For Twitter: Create a list of 5-10 different tweets based on your opt-in and freebie with calls to action, testimonials and pain points. In all of these tweets include your link. Then be sure to schedule these tweets to post a few times a day. For Facebook: Create a custom tab that showcases your opt-in and freebie displayed in the left column of your page by using an app. Since you already have your squeeze page created and have the bit.ly link this step isn’t as daunting as it seems. Click here for a great step-by-step tutorial on how to create a custom tab or app for your Facebook Page. For LinkedIn: Create a few posts that relate to your business why, your prospect client’s vision and goals, and to the benefits of your freebie. In each post link to your squeeze page via the bit.ly link. Then schedule or share these post a few times per month. For Instagram: Create a visual post that relates to your freebie and opt-in. Perhaps you can re-purpose the pin you made for Pinterest here. Make sure you have posted the link in your header/profile section. Occasionally share a post that references that link in your header. Keep that post alive (and have others help you) by refreshing it with new comments and hashtags every so often. This is so easy. I still want you to have your opt-in box on your home page, but when you share your home page from your social media sites, there are distractions. When you tweet “Grab my free ebook all about xxxxxxx, click here! ->link<- I want there to be no distractions. So send them to that squeeze page, not your home page. Where is the first place you are going to add it? Do it now, before you forget! Keep this blog post handy to remind you and do one step a week until you have all your list building bases covered. Want to know the one place to put that bit.ly link to give you the most bang for your buck? Join my LinkedIn group and ask me! Thanks for the ideas! I think what I find challenging is trying to do it all and keep the info/opt-in interesting & up-to-date. And thank you for the how to on custom FB tabs!